After my first day of wandering in the streets of Yangon, I flew to Heho wanting to be immersed in the water-world lifestyle of the Intha people in Inle Lake. Upon arriving at the airport, many cab drivers were waiting for tourists they can bring to the Nyaung Shwe town-proper. The travel time from airport to downtown is approximately 1 hour which costs a little over $50 (if i remember it correctly) via cab. I don’t think there are other means of transportation from Heho to Nyaung Shwe, no train, no bus. Good thing I found 2 tourists, caucasian ladies, willing to share the cab fare with me. It was a long ride but the scenery of the mountain rolls and cliffs kept me entertained all through out the journey. Every tourist has to pay $10 before entering the town proper. The two caucasian ladies alighted directly at the port while I asked the cab driver to bring me to my hotel so I could check-in firstly. I reached Manaw Thu Kha Hotel at past 10 in the morning. I left my bags and rode the same cab I hired back to the port where the Inle Lake tour starts. At the port, they offered me a few tour packages to choose from. . You can go further from the port if you wish, or watch the sunset in the middle of the lake, etc. Since I have started my Inle Lake tour at noon, going further was not an option for me, I preferred to reach the hotel before the dark dominates the sky. The tour costed me approximately $25 for the whole afternoon tour. I waited for more tourists to come so I could share the boat and, of course, to meet more people but unfortunately there wasn’t any one by the time I came there. I was told that normally tourists will come early in the morning when the sunshine doesn’t hurt the skin yet. So there I was, alone. . Just me and the boatman. I put my trust on my sole companion that he’ll bring me to the attractions we have discussed earlier, I put my trust that he won’t harass me or swindle or something (I may have been paranoid, I know. 🙂 ) But as I have read in travel blogs, most Burmese people, if not all, are proven to be very nice and morally upright so my trip was not as disquieting as I feared in my head. The lake water at the port side wasn’t clean, it was muddy brownish and I don’t wanna guess what’s underneath. The motor started and we took off from the port. The noon sun is directly embracing my needy face but the wind was cold so I didn’t feel the heat at all. On our way to the floating villages, we saw a couple of fishermen whose movements were exactly what is iconically portrayed in paintings and photos of people from Inle lake. The conical net, the use of a leg to row a boat, these are unique fishing practices that made them interesting. I took a few photos and advised the boatman to bring me to the floating restaurant to satisfy my starving self. The food was nice, though I was a bit worried wondering if they use the water from the lake to clean their dishes. . I hope they don’t. After filling my tummy up, we continued the journey. We reached the Intha people’s floating villages and I was able to meet locals who have incredible craftsmanship. The first one I saw was the womb-to-tomb creation of lotus fabric which left me in complete amazement. The process is really tedious, people manually extract the fibres from the lotus plant then create a ball of thread (which will take weeks i guess). Then they will cure these threads by boiling and adding colors, let it dry and it will be ready for weaving. They weave these cured threads the ancient style, similar to what we still have in the countrysides of the Philippines. This long process is the very reason why clothes and scarfs made of lotus are very expensive. I’ve also seen boat makers, cigar makers, brass makers, and others. What made this trip memorable to me is that I’ve met Padaung women for the first time. They are the Karen tribe of the Shan state in Myanmar. They wear brass rings around their necks and knees. However, I’ve read in many travel blogs that most daughters are forced to continue this practice for money. These ethnic group is awfully exploited by the tourism industry. Somehow, I felt bad for taking photos of them as if they were mascots of a shop in it’s grand opening. I had mixed emotions thinking that putting the rings around their neck may not be because the tribe values this ethnic culture but because this is their way to earn a living. I felt the ambivalence thinking if tourists would avoid patronizing them, will this unique tradition continue in Myanmar? Apart from the Intha people’s craftsmanship, I also visited some monasteries and admired the beauty of the Burmese architecture. I was able to visit the Nga Hpe Kyaung, popularly known as the Jumping Cat Monastery. In past years, many cats that lived in the monastery were trained by a monk to jump through hoops, hence the religious house’s name. The cats have undeniably made the monastery much more attractive to tourists. Too bad, I was a year late to witness the cats’ tricks as I’ve learnt that the monk who trained them passed away in 2013. There were still many cats continuing to call the monastery home. They may not be jumping anymore but these mushy creatures don’t mind being patted on their heads. The Intha people does not only depend on the lake creatures for food. They also managed to grow vegetation on the lake. I wondered how they do it, they created a floating farm where they have planted tomatoes, eggplants, squash, etc. These extremely able people are indeed living in a water-world like it’s just a piece of cake. The next morning, the same cab driver who drove me from Heho Airport to Nyayung Shwe picked me up from Manaw Thu Kha. I was not able to wait for the Hotel’s breakfast so I asked the cab driver to bring me to an eatery near the airport. 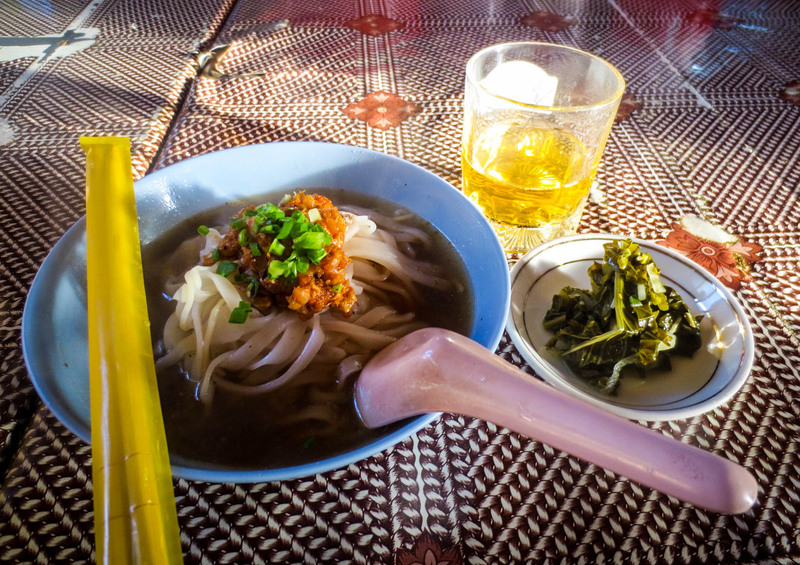 He brought me to a small noodle house where I have tasted the popular Shan noodles in chicken broth. It was yummy and the hot soup was just what I needed to fight the freezing morning breeze. I had my photo taken with the cab driver and bid goodbye to this amazing town. While waiting for boarding (going to Bagan) at the airport, I looked back at my photos and realized I am still the same young Denice in her grade-school, always excited for educational field trips!